Holiday Baking Marathon, Part I has concluded. I mixed, baked and delivered 8 different kinds of cookies this week. The experience was fun, incredibly satisfying, and positively exhausting. I need a nap! So what did I make this week? Snickerdoodles, using Martha Stewart’s recipe. Preparing this dough marked my first experience baking with Crisco. It’s a very strange substance to look at (and taste), but my, does it make for marvelous texture. Can’t wait to make a pie crust with the stuff. Biscotti, the base recipe courtesy of Mr. Mark Bittman. I made two of my own variations: Double Chocolate Hazelnut and Cherry Almond. Almond extract is essential in the latter variation, and adds such a wonderful depth to the flavor of the cookie. The Cherry Almond biscotti were my favorites, hands down. I’ll post the recipes when I make more of these cookies this week. Coconut Lime Butter Cookies, using Bittman’s recipe for butter cookies and making my own variation, adding unsweetened coconut, lime zest and lime juice to the dough, and then rolling the cookies in a mixture of finely shredded coconut and colored sugar before baking. This experiment-cookie turned out to be a crowd favorite. Mocha Brownie Cookies, which is a variation on Chocolate Glaciers. To the base recipe I added finely chopped dark chocolate and 1.5 tablespoons instant espresso. These cookies are incredibly flavorful; the only thing that makes them cookie-like is their shape. Biting into one, you’d swear you were eating a brownie. The Mocha Brownies were the clear winner of the Boyfriend Taste Test award. 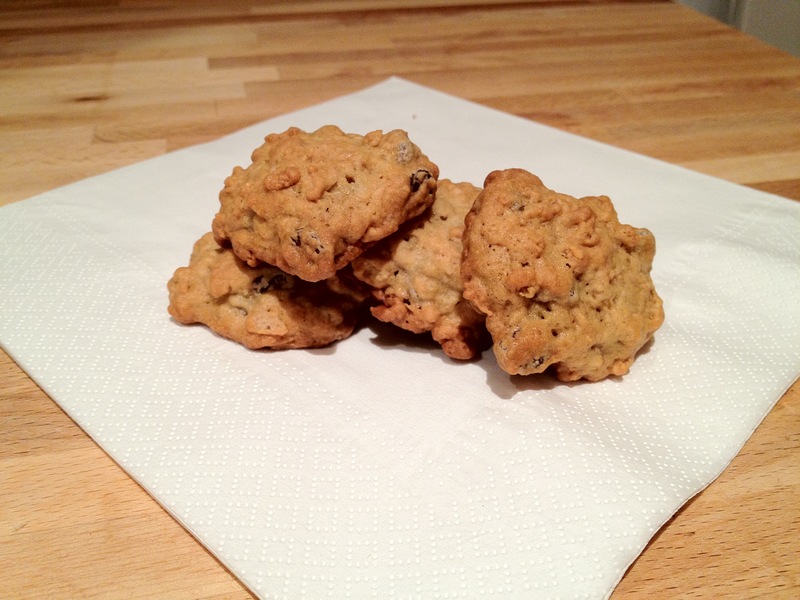 Oatmeal Cookies, with dark chocolate, almonds and coconut. The great thing about Oatmeal Cookies is that you can make endless variations with chocolate, coconut, nuts or dried fruit. The cookie dough can handle a lot. My only regret about this recipe was cutting back on the vanilla extract in favor of using almond extract. Vanilla not only adds a great taste, but it also acts as a flavor-booster, making for a much more richly flavored, cohesive cookie. Peanut Butter cookies, just a half recipe, but for whatever reason they turned out to be thinner, more crumbly and much more fragile than in previous bakings. All the flavor was there, but this cookie was a textural disappointment to me. I’m going to pursue this further as soon as I restock my peanut butter supply. And, there were the infamous Gingerbread Cookies. Also a crowd favorite, I think these get the Best Dressed award. I’ll be doing some more baking (the second part of my marathon) this week for friends and family, though I won’t be sampling any treats until Christmas day. I’ve had copious amounts of sugar in the past seven days—in the form of dough, baked cookies, and alcohol, this being party season and all. I could use some vegetable soup and water. Lots and lots of water. A lot of my experiments in the kitchen over the last few years have focused on “lightening up” traditional recipes for sweet treats. Admittedly, weight loss is difficult to achieve when you have a sweet tooth (okay, a mouth full of sweet teeth) and a discerning palette. I don’t do 100-calorie packs or diet cookies. I can taste the fakeness. I’ve [almost] perfected angel food cake, and meringues of many flavors, but sometimes—many times—I don’t want a light, airy dessert. I want a cookie. Chocolate chip cookies were the first cookies I learned to bake. They may be the first cookies I ever ate. I remember watching my mother get all the ingredients together hours in advance of the actual baking, allowing plenty of time for the butter to soften and for the eggs to get to room temperature. I remember stealing a taste of the dough at every stage of mixing —once the butter and sugar had been creamed together, after the eggs and vanilla had been added, again after the dry ingredients had been mixed in, and finally—blissfully—after the semi-sweet morsels had been stirred in and evenly distributed throughout the dough. My hand got a few good smacks, and I was chastised repeatedly for eating raw eggs, but I didn’t care. I thought it was my duty to ensure that our final product was perfect, and you can almost guarantee a perfect cookie when you have perfect dough. I say “almost” because if you bake chocolate chip cookies even a minute too long, you can miss perfection entirely. Last Sunday, I was faced with a challenge: I wanted a real deal cookie, and I’d also made a really good effort to plan a series of healthy meals for the week, so I didn’t want to make something that would thwart my efforts. How to make a real-deal cookie without all the fat in a real-deal cookie? This is a multi-layered challenge for a number of reasons. Baking being chemistry, altering the fat content of a classic recipe could produce a disaster, and it has in the past (with applesauce). Butter guarantees excellent taste, a perfect crumb, and moisture (as do the eggs). Water or fat-free milk simply would not do. Vegetable oil? Sorry, but no. Chocolate chips are a key ingredient in these cookies. No fat free substitutions would fit in there. Ultimately, there was one solution: keep all the good stuff in, but use less. For guidance, I referred to a recipe from Nick Malgieri and David Joachim’s book, Perfect Light Desserts, “David’s Skinny Chocolate Chip Cookies”. The recipe served as a good starting point: lower in fat, no substitutions for the good stuff, and heavy on the chocolate—perhaps a little too heavy. So, if I cut back on the chocolate chips, what could I add to the ensemble cast of ingredients that would amp up taste and texture without getting in the way of the show’s star, the wonderful semi-sweet morsels? Enter Rice Krispies. Think about it for second. Makes sense, right? 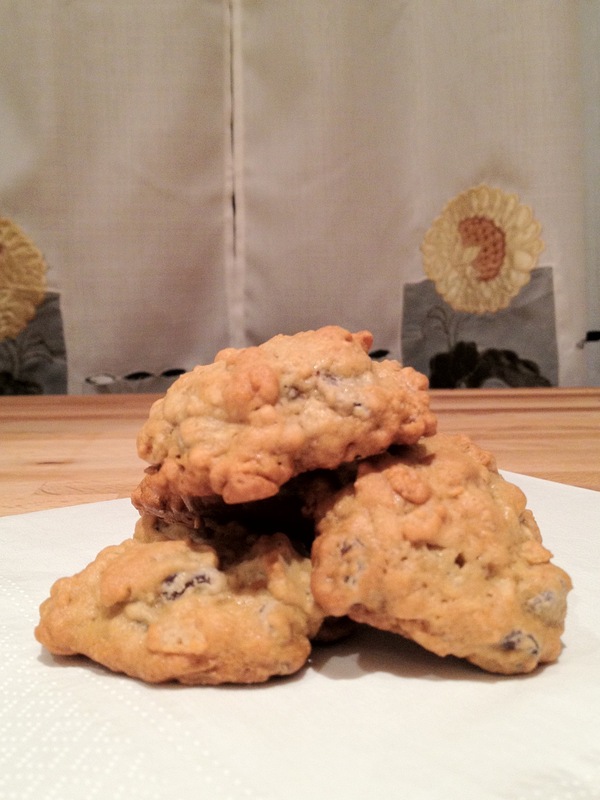 Many bakers have prepared chocolate chip cookies with Rice Krispies (several recipes are available online). They add crunch, and an airy lightness to the cookies. Their sweetness is subtle, but there’s enough of a presence that you can cut back a bit on the white sugar (which I did, by 2 tablespoons from David’s recipe). But I didn’t stop there. After another scan of my pantry, my eyes spied the finely shredded, unsweetened coconut, and I added some of that to the recipe, too. You know, just because. The result, friends, is a batch of wonderful, delicious and truly dynamic cookies—chocolaty, chewy and crispy, warmly sweet, and perfectly satisfying. I sent my boyfriend to work with them on Monday (reserving a few for myself, naturally), and they disappeared very quickly. Then the compliments flowed in, and I knew I couldn’t keep this one to myself. Set racks in upper and lower thirds of oven and preheat to 350 degrees. Line cookie sheets with parchment paper (or lightly grease them). Mix the first 3 ingredients together and set aside. Cream the butter and sugars together in mixer with a paddle attachment on medium for about a minute. (Alternatively you can use electric beaters.) Then beat in egg and milk until they are absorbed, then the vanilla. Scrape down the bowl and beat in the flour mixture on low speed until all ingredients are blended together. Use a rubber spatula to fold in the chocolate chips, Rice Krispies and coconut. Make sure all the additions are as evenly distributed as possible. Chill the dough for at least 15 minutes before baking. Use an ice cream scoop to form the cookies into 1.25” balls, and set each about 2 inches apart in the pan. Put cookie sheets in the oven and set the timer for 8 minutes. At this point you’ll want to check the cookies and see if they’re browning – you want to bake them till they’re just golden to ensure a good balance of chewiness and crispiness. My cookies took about 10 minutes to bake. Cool in pan for 2 minutes, then using a spatula move cookies to cool on a wire rack. These cookies are terrific warm (not hot), or at room temperature. Store between sheets of wax paper in an air-tight container for up to 4 days— if they last even that long.